The weeds and the never-ending easterly winds made the early morning plan of putting together a nice Pompano catch this morning a bit challenging, but the big whiting that have shown up along our area saved the day. My son Randy, Marty Barlow, and myself made the drive to Hobe Sound to take advantage of the great Pompano bite that has been going on in that area recently, however a strong easterly flow and mats of weeds made that spot unfishable. We made the move back up to the north end of Hutchinson Island and Blue Heron Beach, only to find the weeds as thick as they were to the south. As mentioned in previous reports, different beaches can yield different conditions. We looked at Middle Cove Beach and the weeds were much less of a factor there than at the previous locations. We managed to put together a catch some nice Pompano, bluefish, croaker, and big whiting. 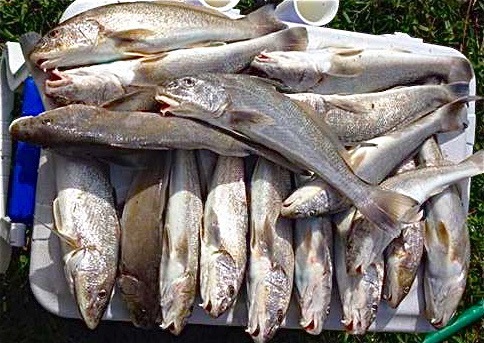 This time of year can yield some of the biggest whiting of the season and after filling the cooler with them today, its safe to say they are here. Fishbites, clam strips, and pieces of cut shrimp were the baits that produced. The strong easterly winds are finally forecast to back off and change direction late this weekend shifting to south. On Monday the winds change to the west and northwest, and then Tuesday should calm down -reducing the weedy conditions. Once this happens we should be treated to some great springtime surf fishing for Pompano, big whiting, croaker, jacks, and bluefish along our entire area.